Lifting my teacup to you. . .
Beautiful picture! Happy New Year. Wishing you many blessings in 2009. Oh how pretty. Happy New Years to you.What stitching projects do you have plan? Happy New Year. Love the picture. Many happy returns to you also! Happy New Year La Donna! Love the contrast between the snowy frosty scene and the steaming hot pot of tea. I had to come back and take another look! No, I can't tell it's child-sized, it looks big! Darling! What an absolutely lovely and charming photo! Happy New Year to you, and thank you for all the joy I get from your blog! I love that picture!! Happy New Year to you, too! Happy New years and God's Best and blessings tooyu and yours LaDonna....Beautiful picture. Happy New Year to you too. Your tea set in the snow is beautiful. What a great shot and one of my favorite tea set patterns too! Fantastic picture! Now did you have tea on the deck? Yes, we were on the same wave length. Beautiful! 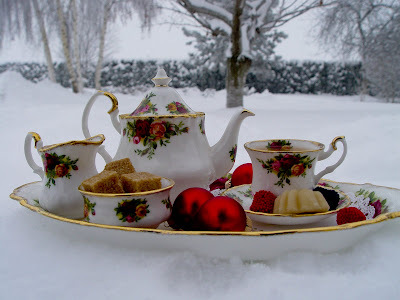 I love the contrast of the teaset in the snow. So fun. I always loveyour blog and also your new blog is wonderful! Thank you! Cheers and a good New Year to you! Happy new year my dear! I'm happy that we are blogging friends for such a long time already! Happy New Year. I left an award for you on my blog. Come and check it out.